This season is all set to showcase collections from 18 prominent designers who will present semi-formal and bridal collections for winters. The audience is quite excited for the week. The Day1 of Fashion Pakistan Week started off with Shameel Ansari who chose to present solo show at her residence. Later, the show started with the eye-catching collections that can’t be overlooked. Designers like Misha Lakhani, Aamna Aqeel, Erum Khan, Obaid Sheikh, Saira Rizwan, and Sana Yasir presented a great show. 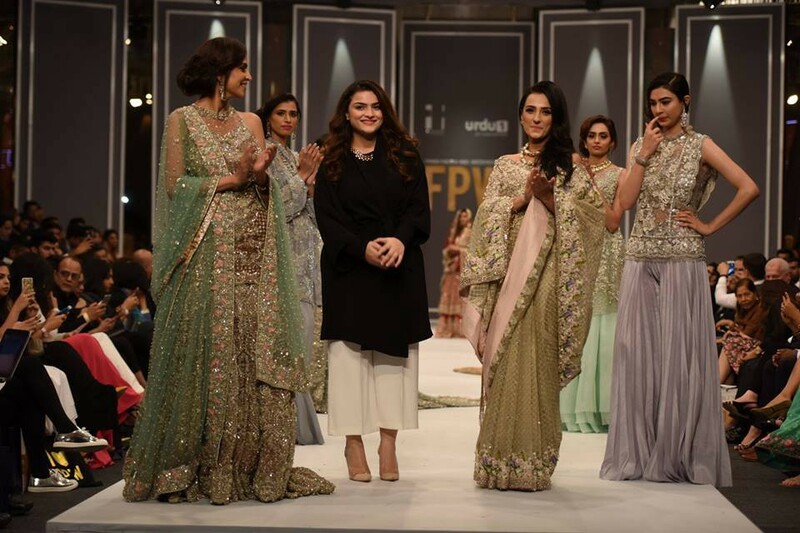 Sana Yasir was the limelight of the show and showed up with her trendy bridal and formal collection featuring the outfits in pastel color scheme. She presented embellished pants and shoulder peplum tops paired with the embellished kaftan that stole the spotlight for us. The designer made sure that the traditional touch stands out with the heavily embroidered lehengas.